Glen Ellyn, IL, U.S.A.: Child Management, Incorporated, 1993. 172 pp. 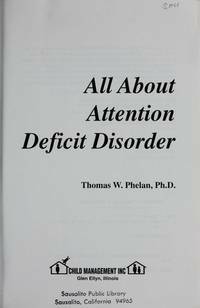 A comprehensive guide to the symptoms, Diagnosis and Treatment of Attention Deficit Disorder in Children and Adults. Softcover has some rubbing to edges, faint creaseing along spine edge, small crease to back top corner, some scuffing. Former owner's stamp on title page. Text is clean and unmarked.. Trade Paperback. Good. Illus. by Mayer, Margaret (illustrator). N.Y.: Frederick Fell Publishers, 1977. 226 pp. Illustrated with b/w photos. Cover has small bumps, creases to corners, clean. No former owner's name. Text is clean, secure and unmarked.. Soft Cover. Good. Chicago: Frederick J. Drake & Co., 1920. 275 pp + index. First Steps in: Intellectual Training, Health Training, Ethical Training, Scoial Training, Language Training, Training Disposition, toys and playthings, home instruction. List of books on Child Training. B/W photos. Interesting attitudes and information. Dj has some dust soiling and a wee bit of edgewear. Looks good in new mylar cover. Text is clean and unmarked. Former owner's stamp on front free endpaper. A good copy of this vintage book. HC and DJ. Good/Good. 7 1/2 x 5.